This Rhubarb Strawberry Sour Cream Pie I have made forever!! One of my absolute favorites for rhubarb. The strawberries accompany the rhubarb so nicely and the sour cream gives it just that right creaminess. I have a big patch of rhubarb at our new house and I couldn’t be more thrilled!! I love making desserts with it or simply poaching it and having it with yogurt for breakfast, YUM!! 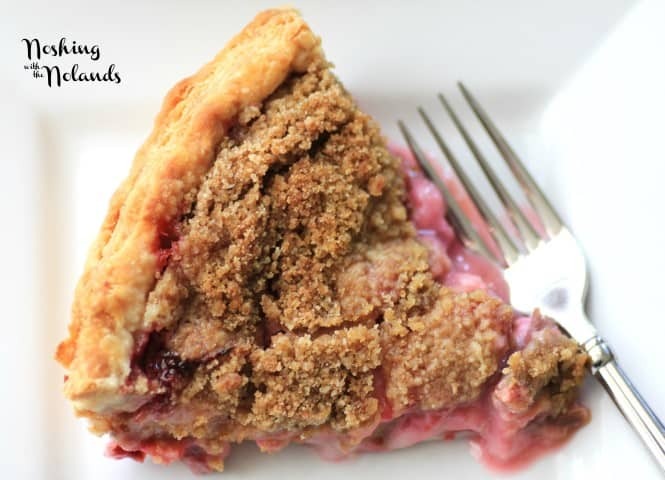 Crispy crumble atop a delicious rhubarb filling with a tender flaky crust underneath. The perfect late summer dessert!! Rhubarb is great because you can enjoy it from early in the season until late!! This weekend I am going to can some rhubarb for later in the winter!! That will be a nice treat when the snow is flying!! I hope you enjoy this pie as much as we have over the years. 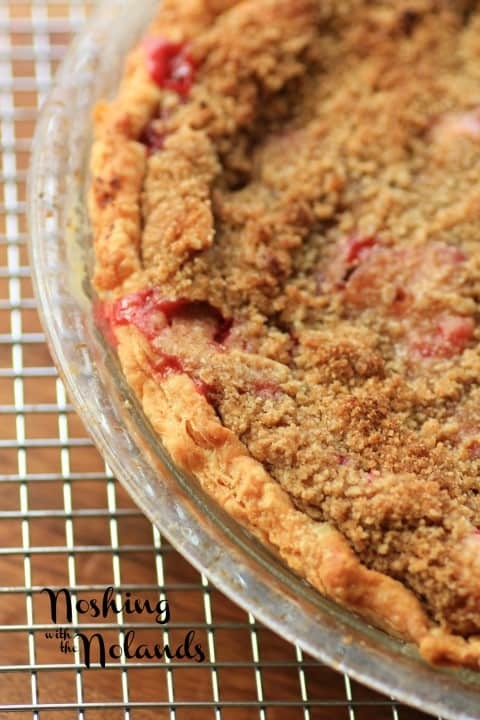 If you have rhubarb still in your yard, what are you waiting for!!! 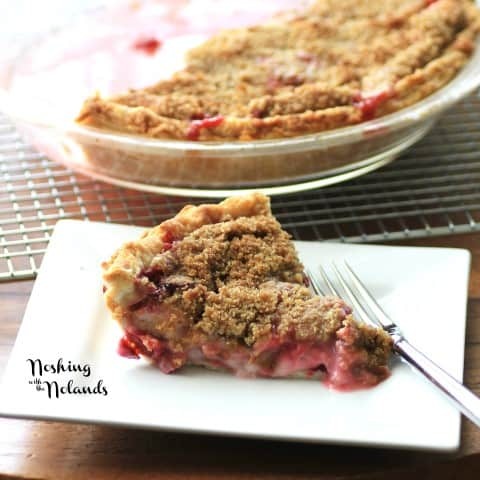 A scrumptious pie celebrating summer with rhubarb and strawberries!! Place the pastry in a 10" deep dish and trim off edges. Arrange rhubarb into shell and scatter strawberries around. Mix the sugar and ⅓ cup of flour together. Stir in the sour cream and pour evenly over the rhubarb strawberry mixture. Combine the butter, ½ cup flour and brown sugar until crumbly. Sprinkle on top. Bake for 15 min. at 450F, then an additional 30 min. at 350F or until fruit is tender and crumbs are golden brown. Cool completely before serving. Tara I love your recipe because there’s more rhubarb than strawberry so it takes center stage. Yes Patty the strawberries are almost an after thought but they go so nicely too!! Tara, I’ve never baked with rhubarb. Can’t wait to try this. OMG, Nancy I love rhubarb!! I bought some beautiful rhubarb at the farmers market yesterday and now it’s begging to go in this gorgeous pie of yours! I love rhubarb, going to can the remainder from my garden today, thanks Maureen!! Hi, I just made your Rhubarb, strawberry, sour cream pie and it looks and smells amazing. Only thing I’m uncertain about is when I mixed the butter, flour and brown sugar it did not get crumbly; am I doing something wrong? Thanks! It is maybe more like sand than crumbly and then sprinkle on top. I have to say I am a little jealous as I love this pie. Thank You…it was amazing. 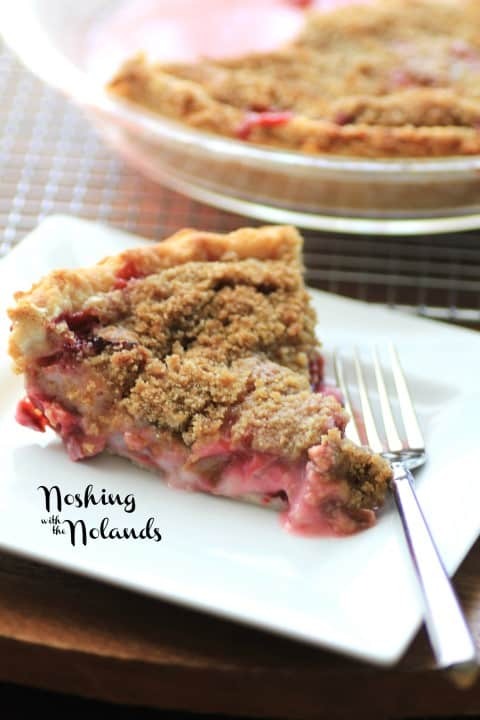 My husband is not a fan of rhubarb pie but he says this is the best and wants me to make it again….Wonderful! Great, thank you so much. I still have to go through my rhubarb patch and get baking. Maybe this weekend we can enjoy one. I’ve never had, nor heard of canning rhubarb. We always clean, cut into approx one inch pcs and freeze ours. I put four cups into each freezer bag and when I need some for a pie or cake the 4 cup bag is perfect. Fast and easy. We love rhubarb. I have canned stewed rhubarb, my daughter loves it. I also freeze it in exact measurements as you do. I have 24 cups of rhubarb frozen in the freezer. I think I have one bag left. Mmmm, maybe pie this weekend! !